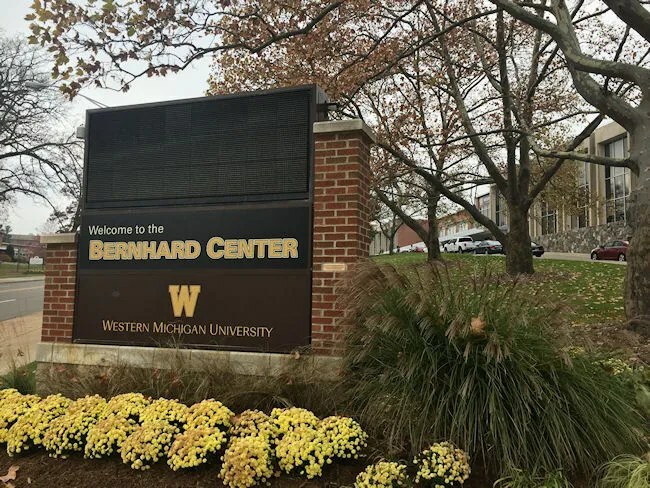 I don’t hang around Western Michigan University much and I sure don’t eat there very often, but I had a quick stop to make on campus near the Bernhard Center and that reminded me of a recommendation I got a while ago about one of their food court options. Now, the recommendation I had was actually for Santorini Island Grill. That’s where I was headed when I walked in….but then something else grabbed my attention. Tacos! Tacos grabbed my attention. I love tacos and I love tacos made the right way. 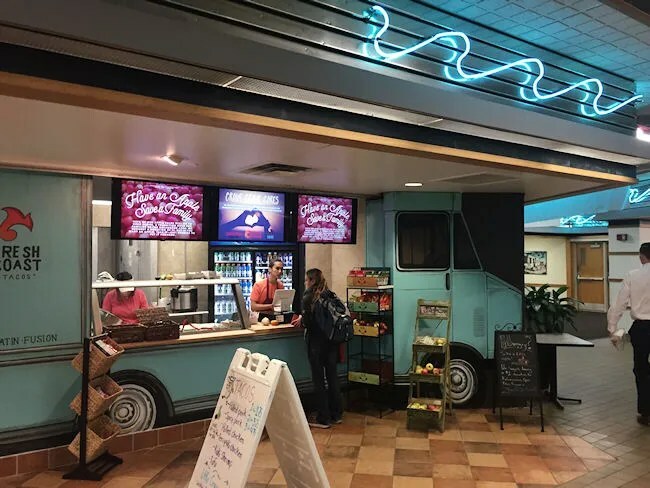 Fresh Coast Tacos is a new addition to the Bronco Mall at the Bernhard Center right in the middle of Western Michigan University’s campus on West Michigan Avenue. 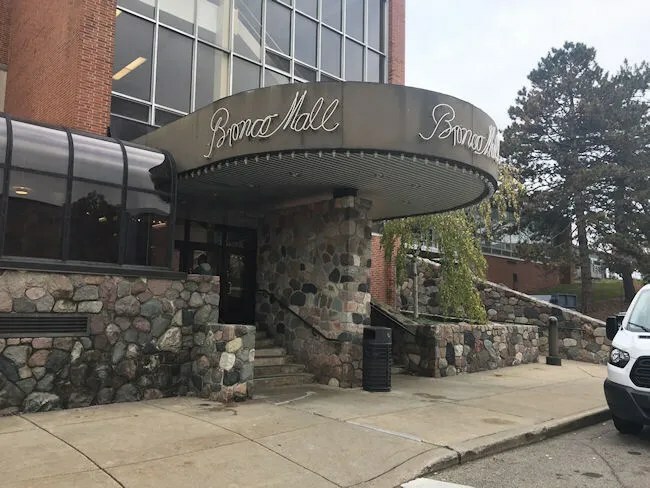 The Bronco Mall is on the lower level of the student center and has it’s own entrance off the service drive that leads to a parking lot off Archer Avenue….that’s a tongue twister. It’s on the east side of the building. The food court is set up like a mall food court. There’s a Subway, a Biggby, Santorini’s and the newest addition, Fresh Coast Tacos. Fresh Coast Tacos actually shares a space with Santorini Island Grill. At first, I didn’t even realize it was two separate restaurants. I started looking at the menu at Santorini and realized it was all Greek food. 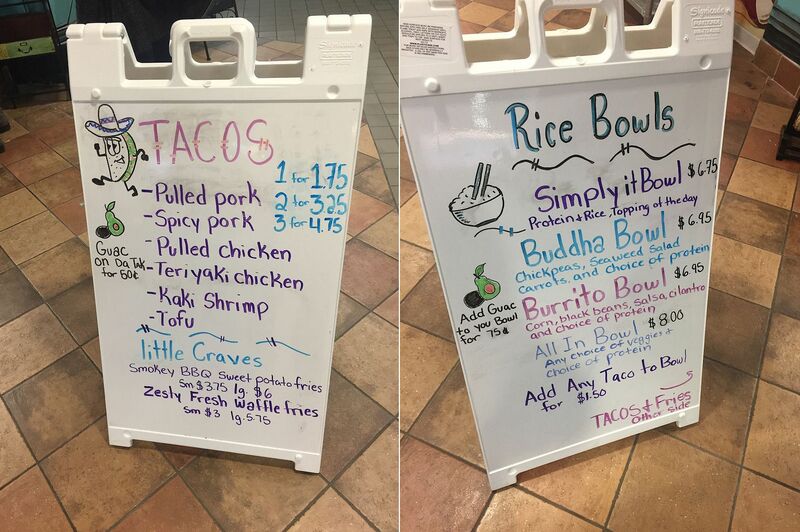 I then noticed a sandwich board with tacos on one side and rice bowls on the other. It was at that point I realized they were two separate spaces. 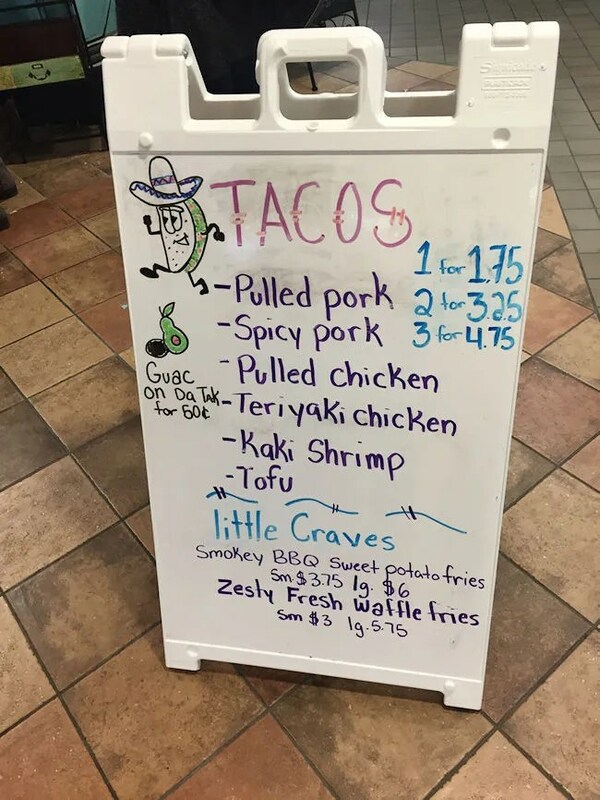 Fresh Coast Tacos has a pretty interesting back story. Normally, I don’t contact owners before I write blogs. Most of my “research” is done online and I just link back to places when I talk about backstory. 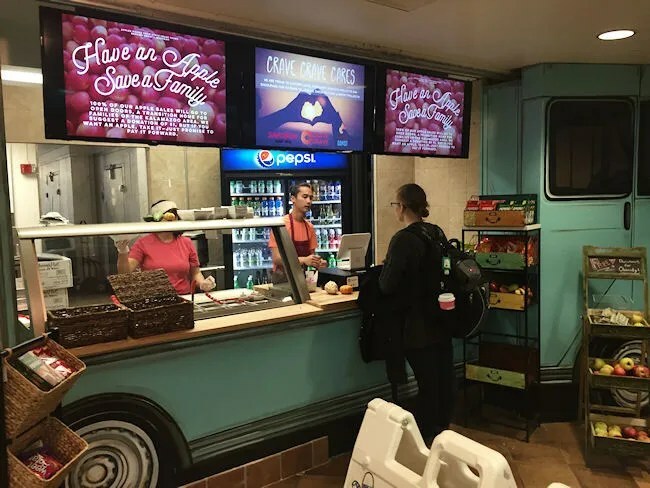 I don’t typically do any kind of “original reporting.” Fresh Coast Tacos is so new and the Facebook page mentions it grew out of a very popular food truck from Indianapolis, so I had to get in touch with the owner just to figure all of this out. I’m still waiting to hear back, but if I do, I’ll update this post just to see how they went from a taco truck in Indianapolis to a restaurant in Kalamazoo. Alright, back to my experience. I wanted tacos and they had six different ones to choose from. I made my choice of the spicy pulled pork and ordered three of them and an order of Zesty Fries. When I walked up to order, the man behind the counter asked if I had any questions about the ingredients. I didn’t because it all seemed like pretty straight forward tacos to me. 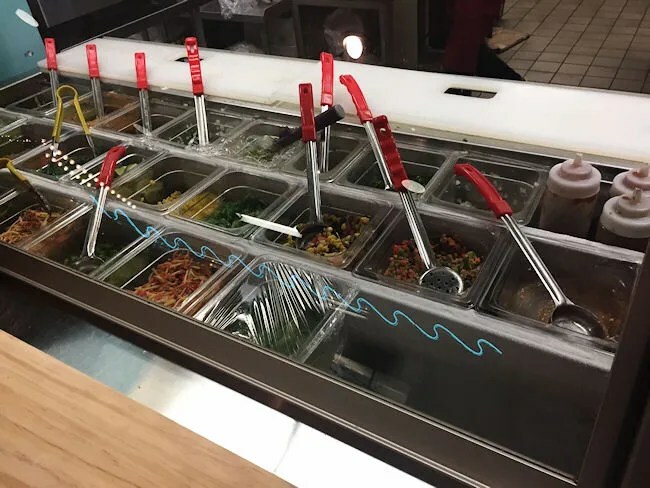 They had all of the toppings laid out on the counter next to the cash register and it looked like almost everything was made fresh. When I put in my order for three spicy pulled pork tacos, I was informed I could get any combination of tacos if I wanted three. There was nothing else that really jumped out at me at the time. I don’t eat tofu or shrimp. I could have tried the two kinds of chicken though, but decided just to keep with the pork. He also asked about a couple different kind of sauces. I did the house made salsa which he described as medium. The tacos are served “Mexicano” style which is just cilantro and onion. I said yes to the cilantro and no to the onion then added jalapenos. Guac was offered for an extra $.50, but I declined that as well. The cost of the three tacos, a small order of Zesty fries, and a bottle of Pepsi came out to just a hair over $10 before the tip. After paying, I watched a different employee assemble the tacos at the topping bar right in front of me. It took her just a couple of minutes to put them together then hand them over the counter in a little paper boat….very reminiscent of a food truck. The fries were still cooking, so I started in on one of the tacos right away while I was waiting. About the time I finish up the first taco, I notice a different employee bringing a large steel bowl out of the back and handing it to the lady that made my tacos. Sure enough, she dumped the contents of the bowl into a paper boat then called my name. 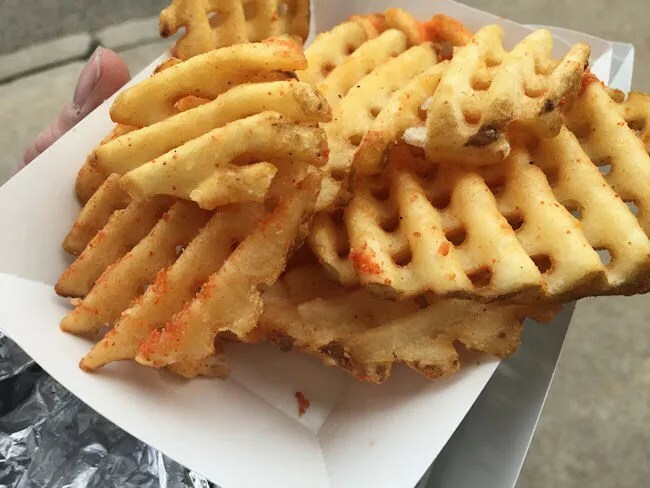 The Zesty Fries are waffle fries with a seasoning on top. My mouth was pretty burned up from the spicy tacos so I didn’t get a good taste of what the “zesty” was, but the fries were good and a good compliment to the tacos. I know…it’s weird. On the one hand, I love Mexican street tacos, but on the other, I like to eat them with fries. Sue me. One last neat deal. They have a couple with racks of apples next to the counter. 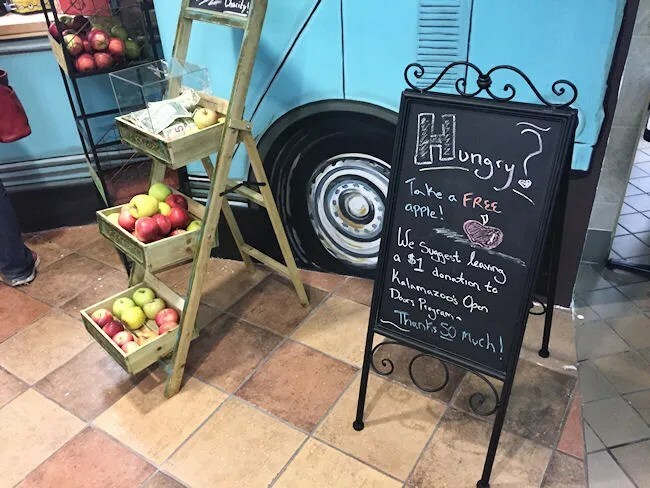 The apples are free to take as a snack, but they encourage a $1 donation to Kalamazoo’s Open Door Program. Never in a million years would I have found Fresh Coast Tacos had I not stumbled into the Bernhard Center looking for something else. Don’t fret, I will go back and try Santorini Island Grill, but I will also go back many, many more times in the future to find more of these great tacos. 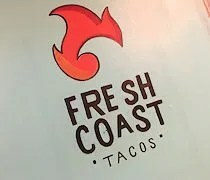 Fresh Coast is such a refreshing take on the street taco. 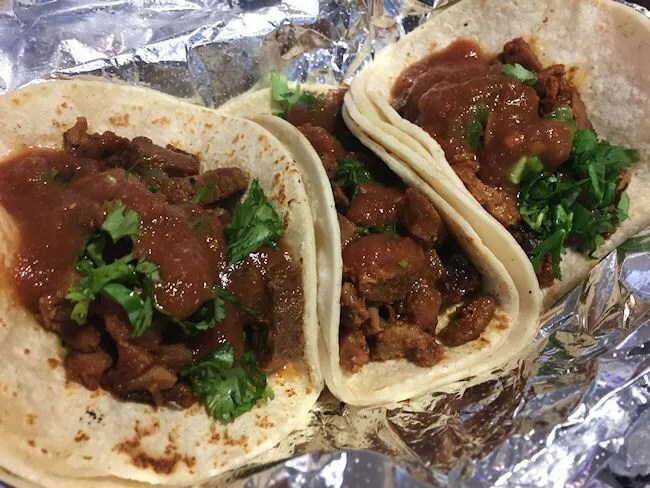 It’s a Asian-Mexican Fusion that does only tacos and rice bowls….and it’s a place that even non-students should seek out when they’re near campus.